Peter Schumann: The Shatterer. Installation view, Queens Museum, 2013. Peter Schumann, view of studio. Glover, Vermont, 2013. 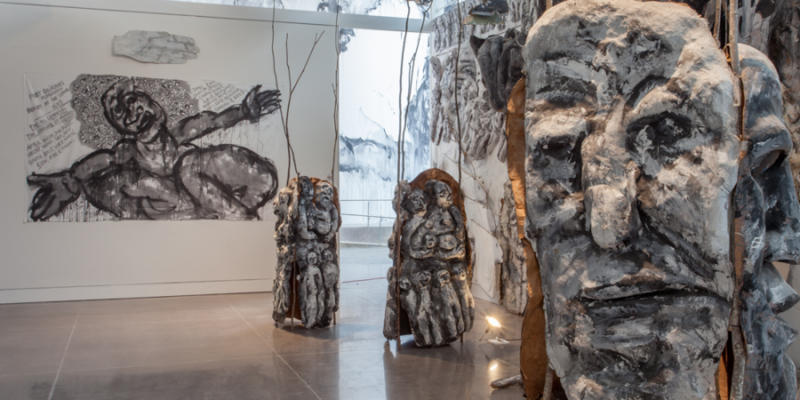 Peter Schumann: The Shatterer is the first solo museum exhibition of Bread and Puppet Theater founder and director Peter Schumann. Opening November 9th 2013 as part of the first season in the Museum’s newly expanded galleries, it marks the 50th anniversary of the Bread and Puppet Theater while introducing New York audiences to a largely unseen body of work by one of the most independent, prolific, and complex artists of our time. 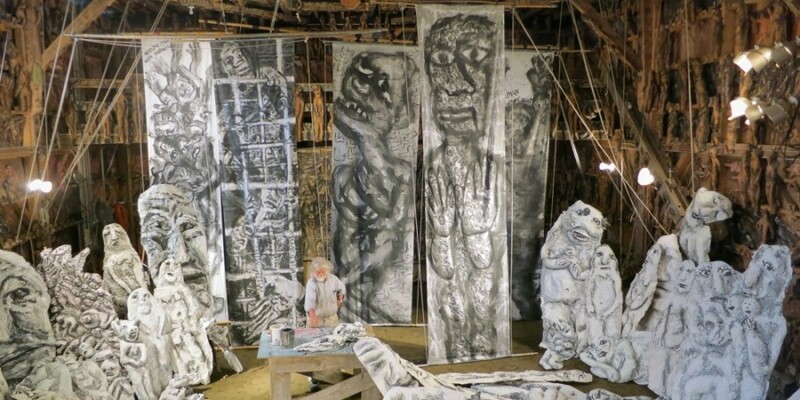 Bread and Puppet’s instantly recognizable 20-foot-high puppets have towered impassively over protests and demonstrations since the Vietnam War, and the theater remains a seminal force in the development of political and experimental theater of the post-war period. 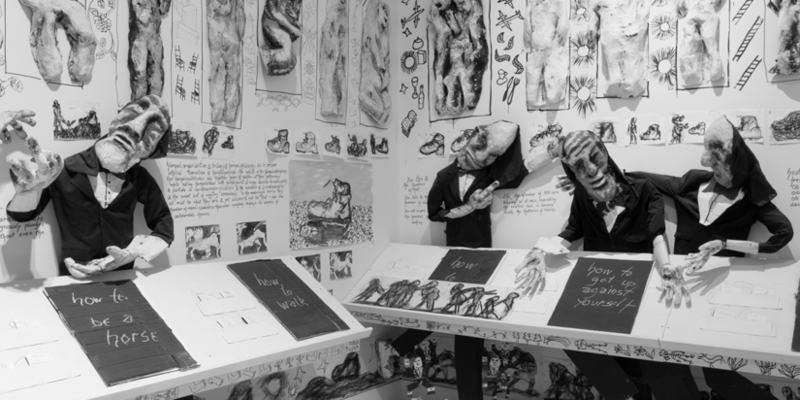 Schumann’s collaborative work with the Bread and Puppet Theater is, however, the endpoint, enactment, and dissemination mechanism of a deeply personal practice. Since 1960, Schumann has independently produced literally thousands of visionary works, including books, performance-lectures, philosophical diagrams, machines, installations and paintings. This presentation of Schumann’s work is a demonstration of his unique aesthetic sensibility and complex ideological stance, and responds to today’s urgent questions about the role of the artist in society at a key moment for both the Museum and Bread and Puppet. 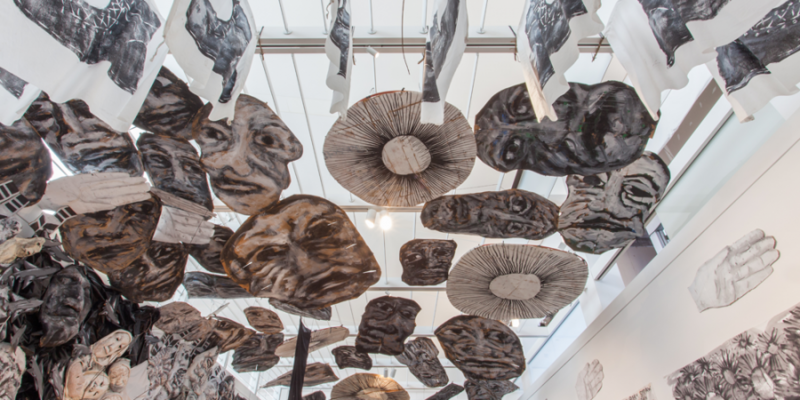 The Shatterer will consist of two new large-scale immersive installations, created specifically for the Museum’s new galleries, combining painting, drawing, papier-m"ché sculpture, and handmade books. Among the materials used are existing pieces dating back some 50 years, which Schumann will deconstruct and reconstruct entirely, surveying his own work through the urgent lens of the present. A mural on the 40 x 100-foot wall of the Museum’s new atrium will accompany the two gallery installations. 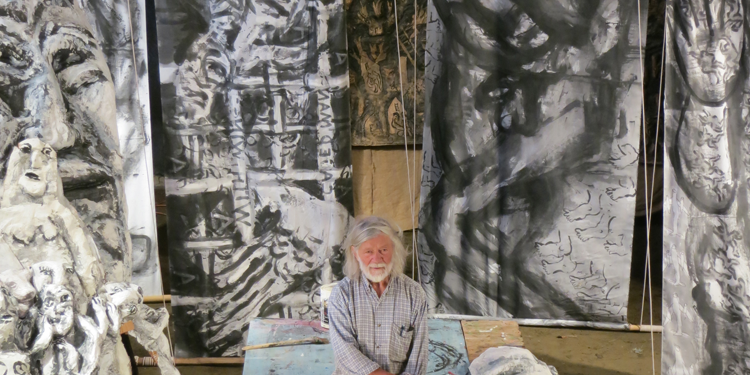 Schumann has chosen to render the exhibition and mural exclusively in black, white, and grey, using only house paint applied to discarded and recycled paper, cardboard, and fabric—a reflection of the bare-essential production values and approach to living that have been central to his work for his entire career. Schumann will also stage monthly solo performances in a "papier-m"ché chapel” housed within the larger installation, and will be baking bread in a portable brick oven on November 11, December 14, January 11, February 15, and March 15 from 1-5pm. After arriving in the U.S. in 1961, Peter Schumann, German-born artist-dancer, founded Bread & Puppet Theater in 1963 in New York’s Lower East Side. 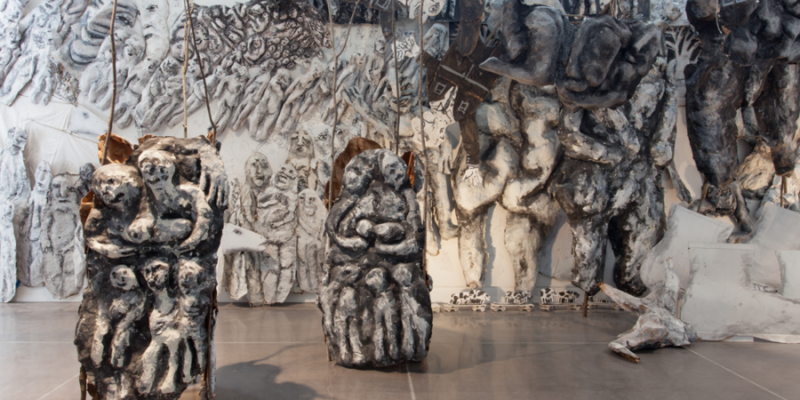 Schumann’s background in dance and sculpture coupled with his upbringing in the aftermath of World War II heavily informed the mission of the theater, taking a makeshift approach to the creation of elaborate large-scale performances, which combine huge puppets, masked characters, experimental movement, surreal imagery, and unflinching political commentary. During the 1960s and after the Theater’s giant puppets figured prominently in anti-Vietnam War demonstrations in New York City, Washington DC and other cities in the U.S. and abroad. Indoor performances were both simpler and more complex, ranging from quiet, intense masked shows (“Fire”, “Man Says Good-Bye”) with 4-6 players, to huge, lengthy spectacles (“Cry of the People for Meat”). In 1970, an invitation from Vermont’s Goddard College to be theater-in-residence facilitated a change to country life. “Our Domestic Resurrection Circus,” an outdoor festival of music, art, puppetry and pageantry, began then, and ran almost every summer, growing to crowds of tens of thousands, until 1998. Since then, a smaller more dispersed version, though with giant puppets intact, continues on Sundays in July and August; the company continues touring and work shopping the rest of the year in New England and around the globe; and Schumann continues as director and artist. Peter Schumann has done fiddle sermons for at least 20 years as part of Bread and Puppet Theater’s summertime performance series at their farm in northern Vermont. The sermons, which always merge philosophy and news, are delivered while Schumann vigorously accompanies himself on a fiddle. Come hear strings pop and words echo in the Chapel of No Religion installed at the Queens Museum. Each performance will be accompanied by bread-making, and bread-serving, by the artist, as he has done since 1963. Schumann will be performing monthly during the run of his exhibition, Peter Schumann: The Shatterer. The exhibition is on view November 9, 2013-March 30th, 2014 with an Opening Reception from 7-9pm on November 11th. In collaboration with KARMA (NYC based publisher), Peter Schumann will produce an artist book to accompany the exhibition. 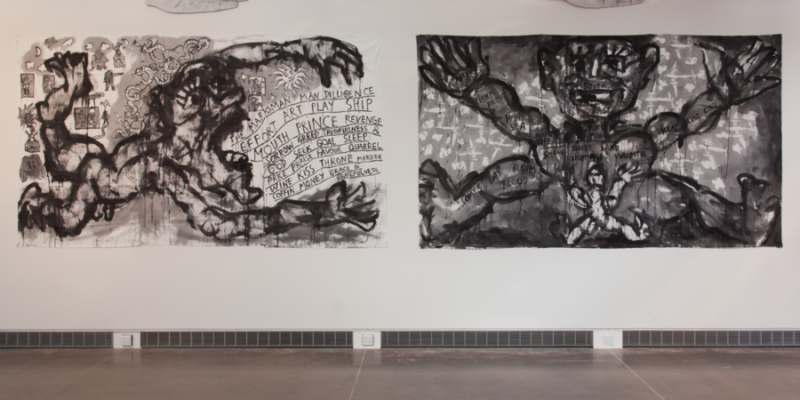 Peter Schumann: The Shatterer is curated by Jonathan Berger and organized at the Queens Museum by Larissa Harris. Peter Schumann: The Shatterer has been generously supported by grants from the Lily Auchincloss Foundation, The Jim Henson Foundation, and the Puffin Foundation. 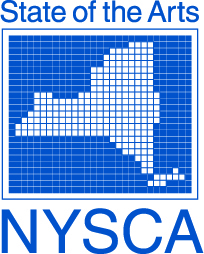 Additional funding provided by the New York City Department of Cultural Affairs and New York State Council on the Arts with the support of Governor Andrew Cuomo and the New York State Legislature.